normally aspirated 705 cubic inch engine. 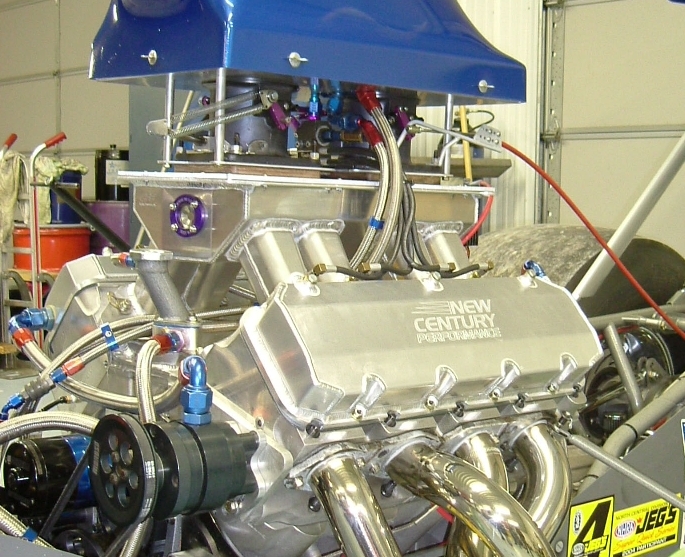 Engine is based on a 11.7” deck full wet New Century block with aluminum main caps. A Callies 5.3” stroke Magnum crank spins on Callico bearings and is hooked to a set of gas ported Arias pistons with GRP 5300 series rods. The short block is topped with a set of CNC ported Sonny’s 14.5 degree heads flowing through a CFE fabricated intake manifold. The air is metered by a pair of Ron’s throttle bodies equipped with a Kinsler fuel metering system.